Are you running efficiently, or are you wasting more energy than necessary bouncing up and down, thus potentially injurying yourself? Would you like to evaluate the efficiency of different running styles? When you run your body uses energy stored in your muscles to allow you to move forward. However, only part of the energy spent is directed forward: a portion of it is always acting in the vertical direction. This is used effectively by efficient runners (and by kangaroos) to generate the lift required to counteract the force of gravity while moving forward. However, too much bouncing in human running is detrimental to good form, and may also increase the risk of injury, as the vertical component of the total energy is ultimately absorbed by your back and knees. Kangarun allows you to test your running form in a simple way. With a 2-minute running test, you can now measure your running efficiency as a comparison between the energy used to propel forward and the total energy spent during exercise. The latter includes a vertically-directed component and a forward-directed one, which depends on speed. The result is a percentage value of efficiency: low values indicate poor performance, with too much bouncing for the resulting speed, while high values signal an efficient use of the vertical lift. 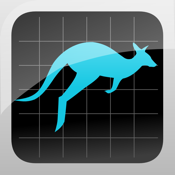 Kangarun also measures and plots your average step frequency and pace. These values are stored by the application, together with the running efficiency, and can be reviewed anytime from the 'History' view. You can thus compare the test results of different running styles, to find the most efficient one (the one that achieves an optimum speed with minimal vertical energy expenditure). You can test your running form on a treadmill, at your pre-defined fixed pace (this is the recommended and most precise method) or outdoor, letting Kangarun automatically detect your average speed.